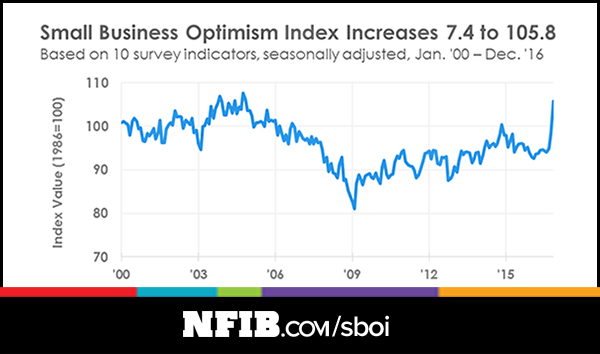 Small business optimism rocketed to its highest level since 2004, with a stratospheric 38-point jump in the number of owners who expect better business conditions, according to the monthly National Federation of Independent Business (NFIB) Index of Small Business Optimism, released today. The article goes on to say that while optimism is up, hiring activity still remains flat. The markets have also flattened out as everyone is taking a ‘wait and see’ attitude to see what actually gets through Congress this year. It’s a pretty long and detailed article and definitely worth a look. There is also a PDF download for all the graphs on the page. We also have a wait and see attitude, but are updating our clients’ marketing strategies to take advantage of the upswing when it happens.